Download "AGREEMENT On the Uniform Principles and Rules Governing Market Circulation of Medical Devices within the Eurasian Economic Union"
3 (c) establishing uniform rules governing market circulation of medical devices in accordance with the recommendations of the International Medical Device Regulators Forum (IMDRF); (d) working out uniform approaches to creating a medical device quality assurance system; (e) harmonizing the medical device nomenclature used in the Member States with the Global Medical Device Nomenclature (GMDN); (f) harmonizing laws of the Member States pertaining to control (oversight) of market circulation of medical devices. 3. For the purposes of implementing this Agreement, a Member State shall designate a government agency (or agencies) authorized to implement and/or coordinate efforts in the field of market circulation of medical devices in the territory of this Member State (hereinafter referred to as the authorized agency ), and shall apprise the other Member States and the Eurasian Economic Commission (hereinafter referred to as the Commission ) of this authorized agency. 4. The Commission shall coordinate the efforts aimed at harmonizing the laws of the Member States pertaining to market circulation of medical devices. 5. 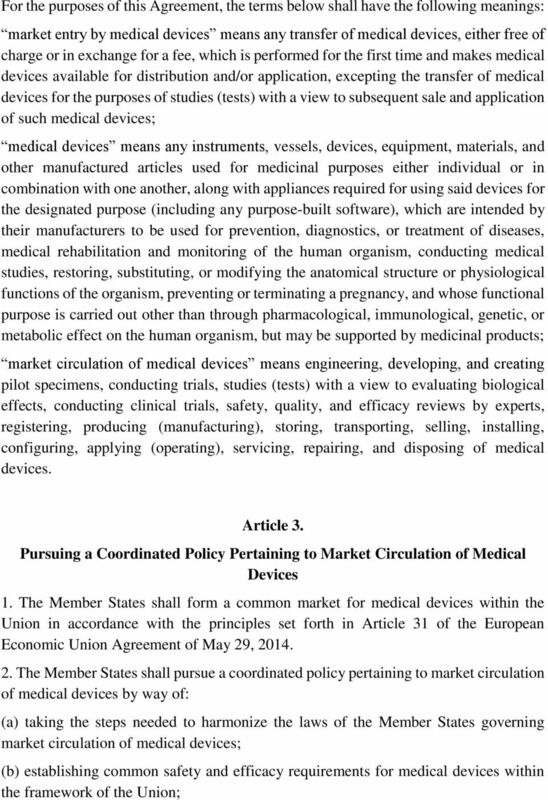 The laws of the Member States pertaining to market circulation of medical devices shall be harmonized on the basis of international standards, taking into account the resolutions of the Commission governing market circulation of medical devices. 6. Authorized agencies shall collaborate in matters pertaining to market circulation of medical devices, including by way of staging and coordinating scientific research, workshops, seminars, and other activities. Authorized agencies shall arrange experience exchange activities and joint training for professionals involved in market circulation of medical devices. Authorized agencies or organizations of the Member States authorized by them shall conduct consultations with the participation of Commission representatives with a view to coordinating the positions of the Member States in matters of market circulation of medical devices. Article 4. Registration of Medical Devices 1. 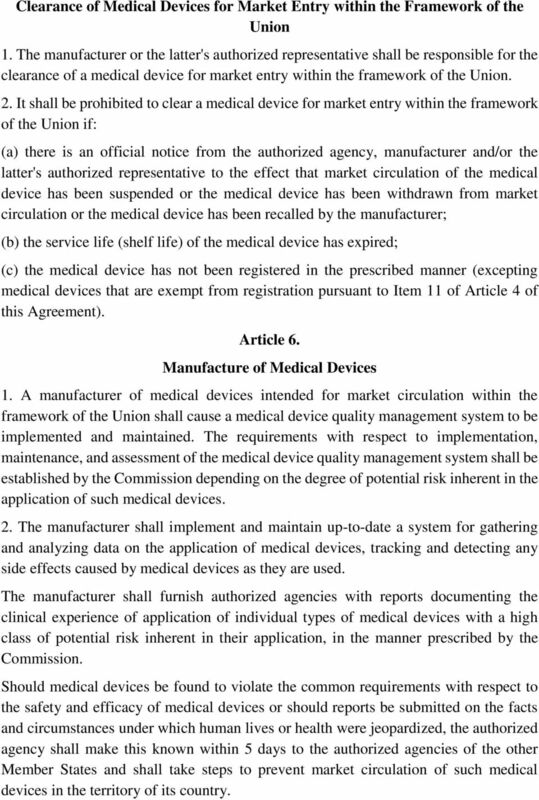 The provisions of this article shall apply to medical devices cleared for market entry within the framework of the Union from the effective date of this Agreement. 4 2. Medical devices cleared for market entry within the framework of the Union shall be subject to registration in the manner prescribed by the Commission. Medical devices shall be registered by authorized agencies. Expert review of the safety, quality, and efficacy of medical devices for registration purposes shall be performed by the expert organization designated by the government agency of a Member State having jurisdiction over healthcare in the manner prescribed by the Commission. 3. For registration purposes, identical requirements shall apply to medical devices manufactured within the framework of the Union and to those imported into the customs territory of the Union from third countries. 4. Technical trials, studies (tests) to evaluate the biological effect, clinical trials, tests for the purposes of obtaining approval of the type of measuring instruments (with respect to medical devices belonging to measuring instruments per the list approved by the Commission), and expert review of the safety, quality, and efficacy of medical devices shall be undertaken for the purposes of registering medical devices. The rules governing classification of medical devices depending on the degree of potential risk inherent in the application of such medical devices, the rules for maintaining the nomenclature of medical devices, the general safety and efficacy requirements for medical devices, the requirements for operation manuals of medical devices, the rules for performing studies (tests) on medical devices, the rules for registering medical devices (including requirements with respect to the registration dossier, the registration application, the grounds and procedure for suspending or terminating (revoking) the registration certificate of a medical device), and the rules for performing expert review of the safety, quality, and efficacy of medical devices shall be approved by the Commission. 5. Authorized agencies shall compile a list of institutions, organizations, and enterprises, including medical institutions and organizations, that are authorized to perform studies (tests) on medical devices for registration purposes (hereinafter referred to as the authorized organizations ). The requirements for authorized organizations and the procedure for evaluating them for conformance to such requirements shall be established by the Commission. 6. A medical device registration certificate valid within the framework of the Union shall be the document proving registration of the medical device. The form of the registration certificate and the rules for completing it shall be established by the Commission. The registration certificate shall be issued without an expiration date. 5 7. 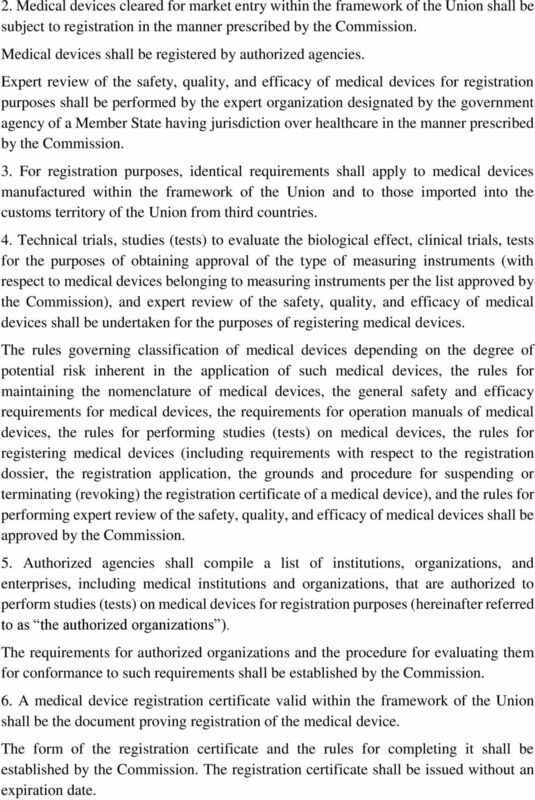 The Member States shall create conditions conducive to ensuring the conformance of the study (test) practices and conditions and the comparability of the results of expert reviews through applying common medical device safety and efficacy requirements and uniform requirements for authorized organizations. 8. Authorized organizations shall mutually recognize the results of studies (tests) and expert reviews obtained in the course of medical device registration, provided that they have been completed in accordance with the requirements and rules established by the Commission. 9. Any controversies arising among authorized agencies during registration of medical devices shall be resolved in the manner prescribed by the Commission. 10. A decision by an authorized agency to deny issuance of a medical device registration certificate may be appealed by the medical device manufacturer or the latter's authorized representative with a court of a Member State in the manner prescribed by the laws of this Member State. 11. 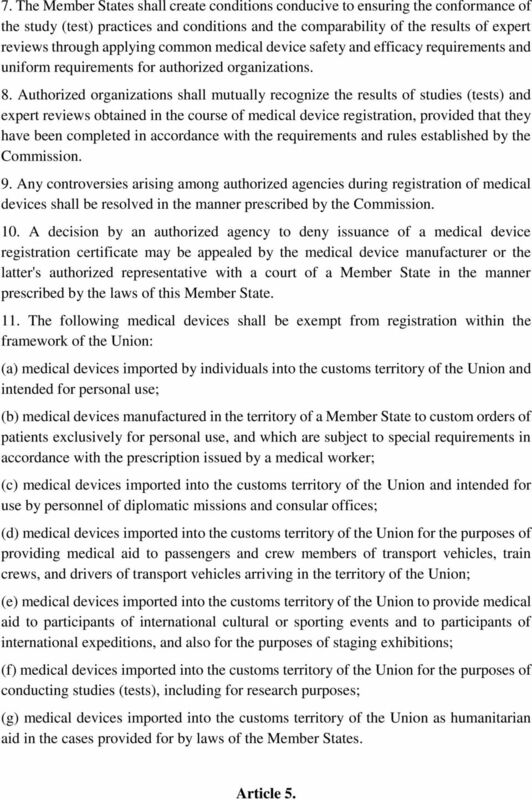 The following medical devices shall be exempt from registration within the framework of the Union: (a) medical devices imported by individuals into the customs territory of the Union and intended for personal use; (b) medical devices manufactured in the territory of a Member State to custom orders of patients exclusively for personal use, and which are subject to special requirements in accordance with the prescription issued by a medical worker; (c) medical devices imported into the customs territory of the Union and intended for use by personnel of diplomatic missions and consular offices; (d) medical devices imported into the customs territory of the Union for the purposes of providing medical aid to passengers and crew members of transport vehicles, train crews, and drivers of transport vehicles arriving in the territory of the Union; (e) medical devices imported into the customs territory of the Union to provide medical aid to participants of international cultural or sporting events and to participants of international expeditions, and also for the purposes of staging exhibitions; (f) medical devices imported into the customs territory of the Union for the purposes of conducting studies (tests), including for research purposes; (g) medical devices imported into the customs territory of the Union as humanitarian aid in the cases provided for by laws of the Member States. Article 5. 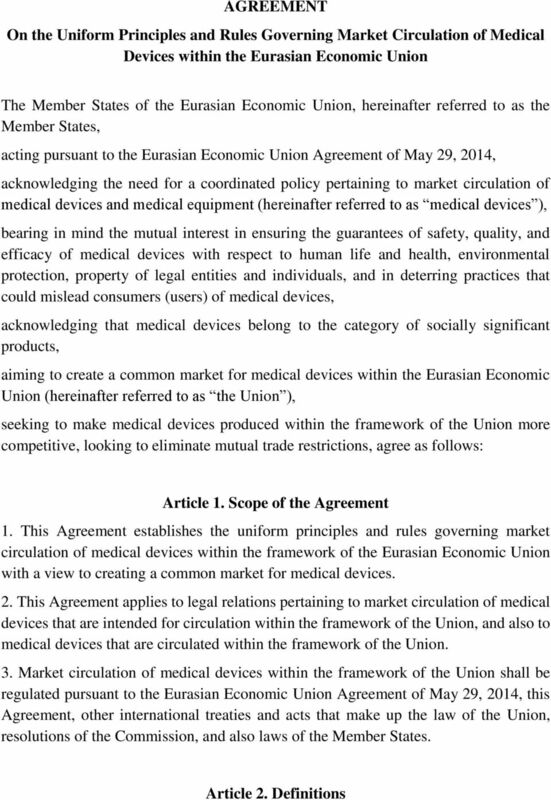 6 Clearance of Medical Devices for Market Entry within the Framework of the Union 1. The manufacturer or the latter's authorized representative shall be responsible for the clearance of a medical device for market entry within the framework of the Union. 2. It shall be prohibited to clear a medical device for market entry within the framework of the Union if: (a) there is an official notice from the authorized agency, manufacturer and/or the latter's authorized representative to the effect that market circulation of the medical device has been suspended or the medical device has been withdrawn from market circulation or the medical device has been recalled by the manufacturer; (b) the service life (shelf life) of the medical device has expired; (c) the medical device has not been registered in the prescribed manner (excepting medical devices that are exempt from registration pursuant to Item 11 of Article 4 of this Agreement). Article 6. Manufacture of Medical Devices 1. A manufacturer of medical devices intended for market circulation within the framework of the Union shall cause a medical device quality management system to be implemented and maintained. The requirements with respect to implementation, maintenance, and assessment of the medical device quality management system shall be established by the Commission depending on the degree of potential risk inherent in the application of such medical devices. 2. The manufacturer shall implement and maintain up-to-date a system for gathering and analyzing data on the application of medical devices, tracking and detecting any side effects caused by medical devices as they are used. The manufacturer shall furnish authorized agencies with reports documenting the clinical experience of application of individual types of medical devices with a high class of potential risk inherent in their application, in the manner prescribed by the Commission. Should medical devices be found to violate the common requirements with respect to the safety and efficacy of medical devices or should reports be submitted on the facts and circumstances under which human lives or health were jeopardized, the authorized agency shall make this known within 5 days to the authorized agencies of the other Member States and shall take steps to prevent market circulation of such medical devices in the territory of its country. 7 3. 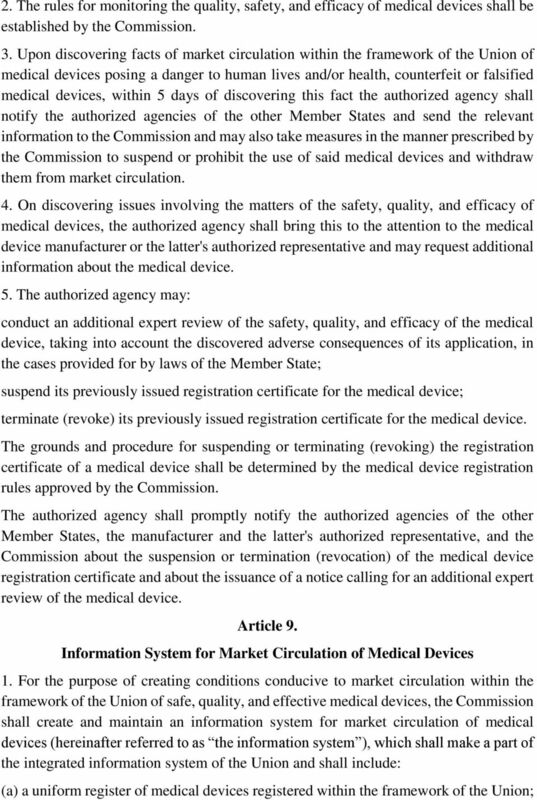 If the manufacture of a medical device has been discontinued, the manufacturer or the latter's authorized representative shall present the relevant information to the authorized agency that issued the medical device registration certificate within 30 calendar days from the date of the decision to discontinue manufacture of this medical device. Article 7. Marking of Medical Devices 1. 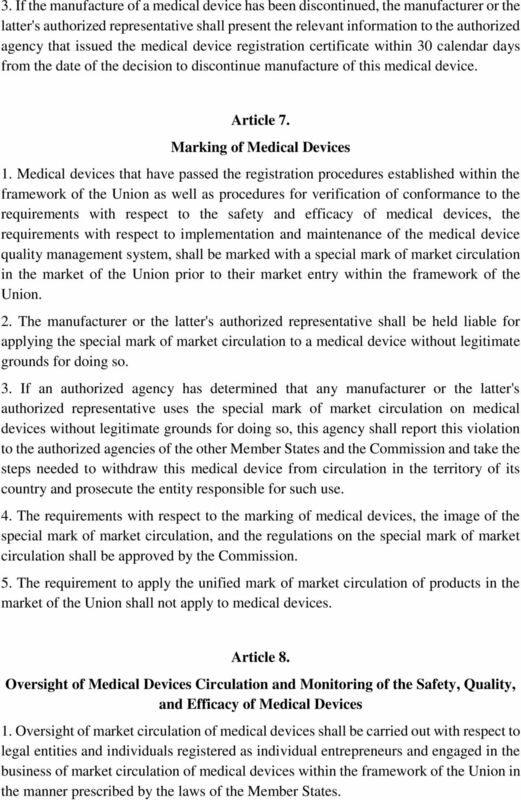 Medical devices that have passed the registration procedures established within the framework of the Union as well as procedures for verification of conformance to the requirements with respect to the safety and efficacy of medical devices, the requirements with respect to implementation and maintenance of the medical device quality management system, shall be marked with a special mark of market circulation in the market of the Union prior to their market entry within the framework of the Union. 2. The manufacturer or the latter's authorized representative shall be held liable for applying the special mark of market circulation to a medical device without legitimate grounds for doing so. 3. If an authorized agency has determined that any manufacturer or the latter's authorized representative uses the special mark of market circulation on medical devices without legitimate grounds for doing so, this agency shall report this violation to the authorized agencies of the other Member States and the Commission and take the steps needed to withdraw this medical device from circulation in the territory of its country and prosecute the entity responsible for such use. 4. The requirements with respect to the marking of medical devices, the image of the special mark of market circulation, and the regulations on the special mark of market circulation shall be approved by the Commission. 5. The requirement to apply the unified mark of market circulation of products in the market of the Union shall not apply to medical devices. Article 8. Oversight of Medical Devices Circulation and Monitoring of the Safety, Quality, and Efficacy of Medical Devices 1. 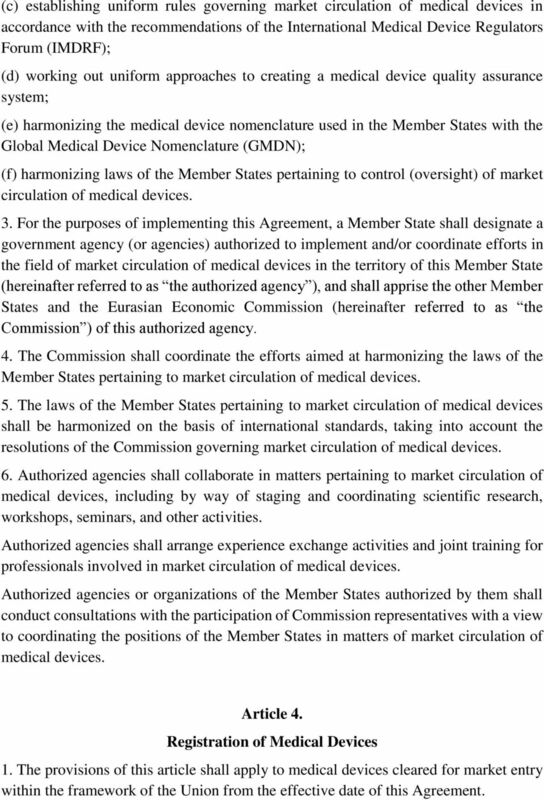 Oversight of market circulation of medical devices shall be carried out with respect to legal entities and individuals registered as individual entrepreneurs and engaged in the business of market circulation of medical devices within the framework of the Union in the manner prescribed by the laws of the Member States. 9 (b) a uniform register of authorized organizations (c) a joint database of medical device safety, quality, and efficacy monitoring data. 2. The procedure for creating and maintaining the information system shall be established by the Commission. Authorized agencies shall submit to the Commission the information required to create the information system. 3. Information included in the information system shall be published on the official website of the Commission on the Internet. Article 10. Confidentiality of Information 1. The authorized agencies and the Commission shall take the steps needed to protect confidential information, including personal data, received and transmitted as part of this Agreement. 2. Before confidential information received by an authorized agency and/or the Commission under this Agreement can be disclosed to third parties, they shall obtain consent from the disclosing party. 3. Information and details contained in the registration certificate of a medical device shall not constitute confidential information. Article 11. 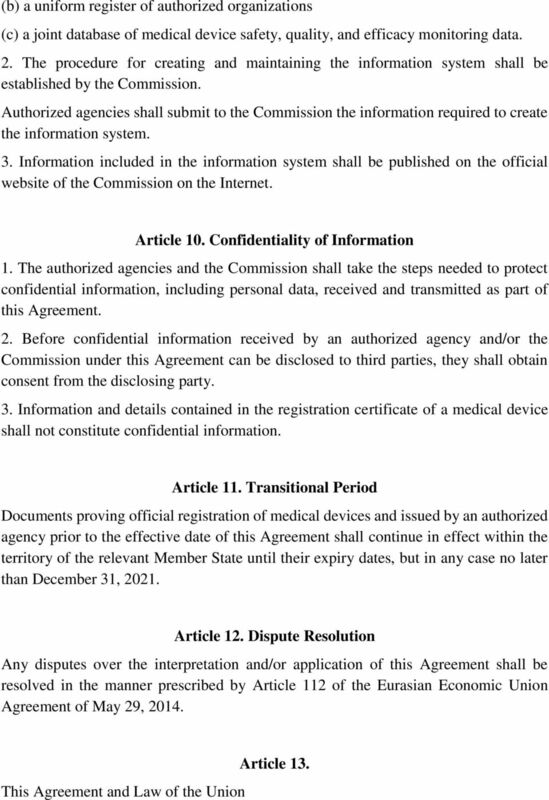 Transitional Period Documents proving official registration of medical devices and issued by an authorized agency prior to the effective date of this Agreement shall continue in effect within the territory of the relevant Member State until their expiry dates, but in any case no later than December 31, Article 12. 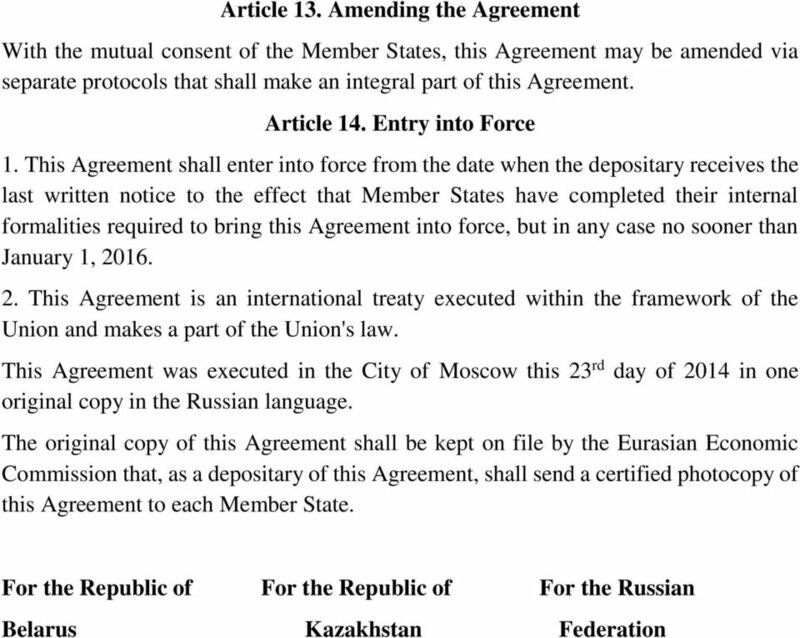 Dispute Resolution Any disputes over the interpretation and/or application of this Agreement shall be resolved in the manner prescribed by Article 112 of the Eurasian Economic Union Agreement of May 29, This Agreement and Law of the Union Article 13. ALARM SYSTEM USER: Any person, firm, partnership, cooperation or other entity which uses an Alarm System at its Alarm Site. Magento Extension License Agreement. License Agreement for Magento Extensions. Codernia Updates as of April 2014. Protocol Concerning Cooperation. in the Administration and Enforcement. of Futures Laws. between the. Israel. Securities Authority. 511-9-2-.07 Licensure of Ground Ambulance Services. (1) Applicability. 27 July 2006 No.152-FZ RUSSIAN FEDERATION FEDERAL LAW PERSONAL DATA. (as amended by Federal Law of 25.11.2009 No.266-FZ) Chapter 1. Section 1. The title of Section 101-07 of Subchapter A of Chapter 100 of Title 1 of the Rules of the City of New York is amended to read as follows: 101-07 [Inspections and] [a] Approved [a] Agencies. RULE 099.33 MANAGED CARE #099.33 TABLE OF CONTENTS I. DEFINITIONS II. INITIAL CHOICE OF PHYSICIAN III. REFERRALS IV. CHANGE OF PHYSICIAN V. MULTIPLE MCOs VI. RULES, TERMS, AND CONDITIONS OF MCO/IMCS VII.